Summer Street by Macy's. Seen recently on a different street. I like this painted box even better than the alien electrical box you showed previously. It is very "green." Funny, I love these improvements! It is such a good idea to bring art out onto the street for everyone to enjoy. It looks a little incongruous just stuck out on the street, even if it is called 'urban renewal'. Don't know what say about this trend. Any injuries... pedestrians walking into 'art'? Ha! 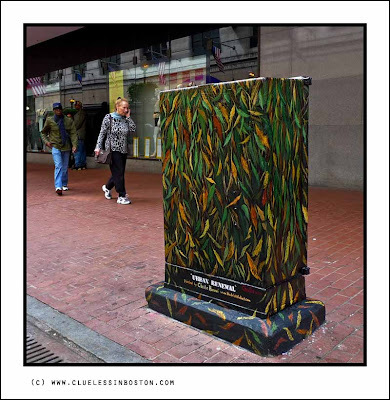 what an interesting way to cover electrical boxes. I think this is nice as it adds art to everyday rather mundane steel equipment. Better than boring grey and at leats it fits the season! I prefer this one to the robot one!